This entry was posted on January 30, 2018 by Zoe Thomas. For Heart Month 2018 we're raving about the importance of first aid and defibrillation training in the workplace. It takes just two hours to train staff to use an automatic external defibrillator (AED) in a life threatening situation, and just two minutes to read our ultimate guide to saving a life at the end of this post. Fill out this short contact form and reference the code: HM18 in your message to get 10% off your booking throughout Heart Month 2018 (February). Please note, this code only applies to our face-to-face AED Awareness course. Why might cardiac arrest happen at work? Within 20 seconds of the heart stopping, the person becomes unconscious. After three to four minutes, brain activity stops. This is why it is so important to start CPR and defibrillation as quickly as possible. Speed comes with confidence, and confidence comes with training. We offer face-to-face first aid training and a first aid refresher e-learning course that staff can take at any time between official training to improve their confidence. Preparing for emergencies should be a critical part of your health and wellbeing strategy. 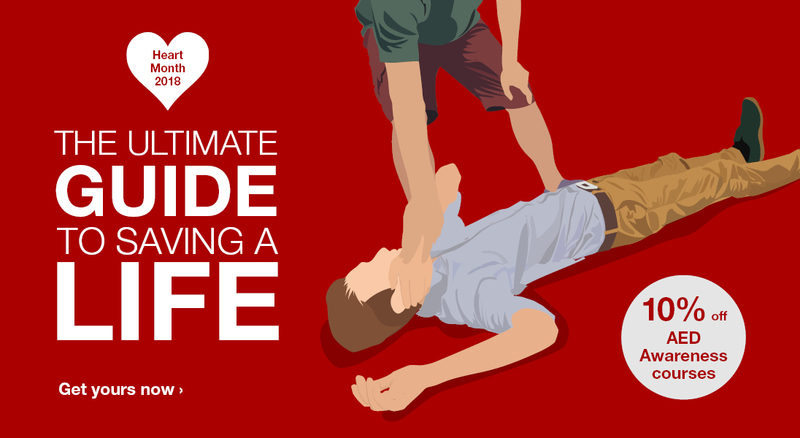 You can start by sharing our 'Ultimate guide to saving a life' with colleagues. To download a PDF of our infographic, click on the image below.